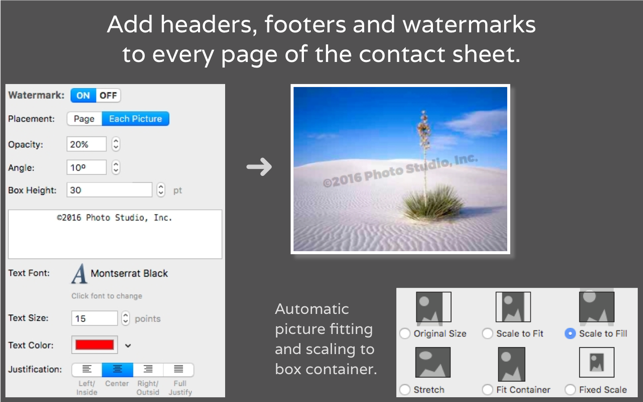 ContactPage Pro allows you to create professional-looking contact sheets of images with captions. Use ContactPage Pro to create picture catalogs, proof sheets, photo books, or anytime you need to quickly browse or print pictures with full descriptive text captions. ContactPage Pro can then build a PDF, image file, slideshow, or page layout document – using Adobe InDesign or QuarkXPress – with all the necessary pages, headers, footers, watermarks, backgrounds, images and captions customized to your liking. - Output as PDF, slideshow, images for each page, or InDesign/QuarkXPress editable documents. - Create separate PDFs for each page, or one PDF with multiple pages. - View and organize the picture list as files, or files within each containing folder. 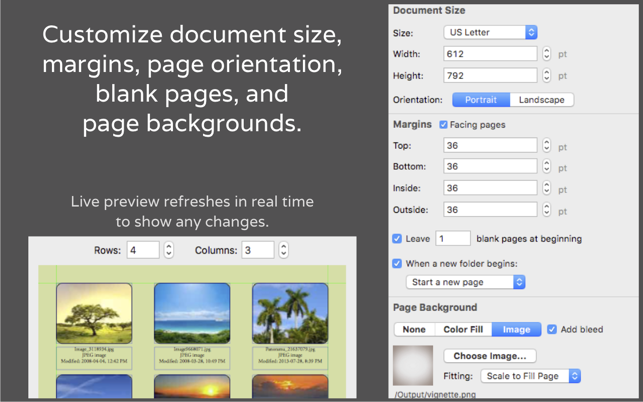 - Customize page size, margins, bleeds, page backgrounds and blank pages. 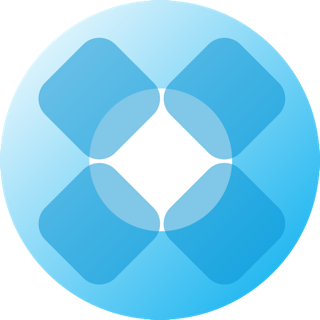 - Select picture box shape, fill color, angle, opacity, drop shadow and strokes. - Auto rotate images to fill the picture box according to picture dimensions. 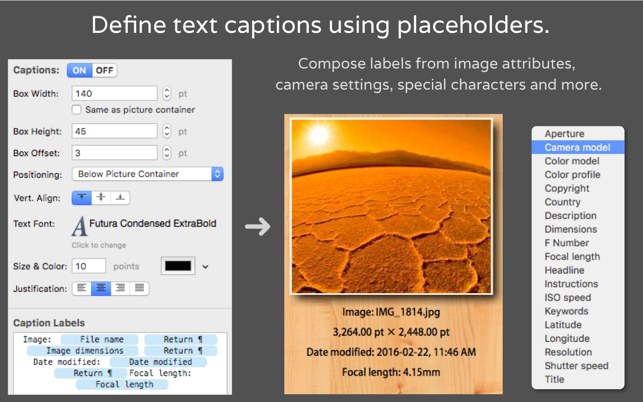 - Compose captions using placeholders, such as file path, dimensions, camera settings, GPS info, and more. - Place captions below, centered or above picture boxes. - Place headers, footers and watermarks. - Real-time live preview, with optional guides, showing exactly how the contact sheet will look. - Custom presets to save commonly-used settings. - Automatic creation of styles sheets in InDesign or QuarkXPress. I’m a full-time photographer who occasionally has to do some design work. One of my clients needs poster-sized directories of everyone in their department (hundreds of people). Before finding ContactPage Pro I tried many other popular photo-related apps. None of them gave me the control I needed. In particular I needed to have some of each image's ITPC metadata appear beneath each photo in the collage. Finally, I stumbled upon ContactPage Pro here in the App store. $15 seemed abit risky for an app I knew nothing about. But I gave it a try and I’m delighted to report that this app works great. It’s not fast but it allows precise control. It seems robust, predictable, extremely flexible, and mostly intuitive. If you require lots of control over your contact sheets I highly recommend ContactPage Pro. After upgrading to Sierra my little camera program that printed contact sheets for me, no longer was compatible. I spent a week trying out other software (and purchasing some useless ones). Most did way too many things. I did not need an editing program, I needed a printing program that I could control. This simple program has met all my needs. I needed to make a contact sheet for 6500+ images. I first tried Bridge and Photoshop — slow and buggy! Then I found this app. 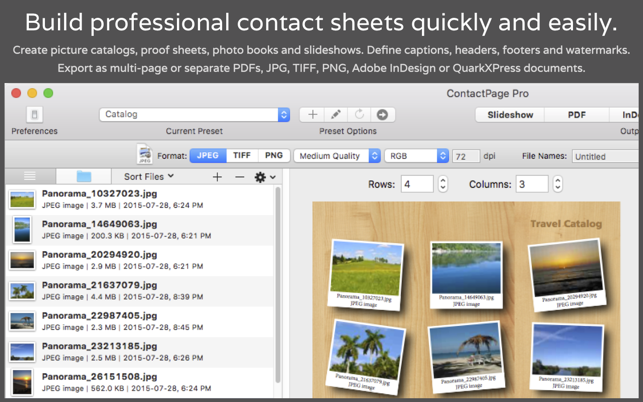 It created a 400 page PDF file contact sheet in just a few minutes — many options and rock solid performance. Highly recommeded! ©1998–2018 Badia Software, a division of Riodia Enterprises, Inc. All rights reserved.